As "Theater, Dance and Media" held its first classes ever this week, some students are already starting to show interest in Harvard’s newest concentration. The program seeks to draw its inaugural class of concentrators later this fall with an official launch on Oct. 1. Martin Puchner, the English and drama professor who led the effort to create the concentration and is now the program’s chair, said the fall offerings unite the academic study of dramatic literature with practical experience. 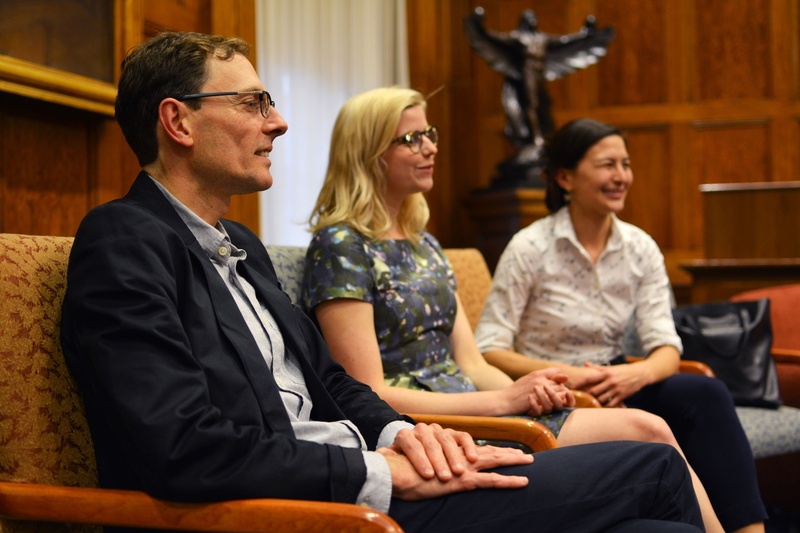 Chair of the Committee on Dramatics Prof. Martin Puchner, left, and graduate students Tarryn Li-min Chun, center, and Elizabeth M. Phillips, right, attended an open forum on the future of theater at Harvard in April. Some of the courses were previously offered in other departments, such as English, while others, such as a course in acting and directing taught by a visiting professor from the Yale School of Drama, are entirely new. Thirteen "Theater, Dance, and Media" courses are currently listed for fall 2015 on the course catalog on the my.harvard portal. Although the program’s faculty intend to accept their first concentrators from the Class of 2018, a small number of juniors who have already completed substantial study of theater have received preliminary approval to join. Aislinn E. Brophy ’17, an English concentrator who intends to transfer, is one of two juniors currently enrolled in the "Theater, Dance, and Media" junior tutorial. Matthew H. Munroe ’17, who hopes to pursue the new concentration jointly with History and Literature, is also enrolled in the tutorial, whose syllabus he and Brophy will help design based on their interests. For his part, Puchner said the program will continue to adapt to the needs and goals of its students as it enters its first year. He added that he sees the program’s adaptability as one of its strengths. The new concentration was approved unanimously by a vote of the Faculty of Arts and Sciences in April after Harvard received a donation to fund it. —Staff writer Elizabeth C. Keto can be reached at elizabeth.keto@thecrimson.com.